Driving south from The Dalles, Oregon on Hwy 197, you are instantly transported into another world. You leave behind the Columbia River Gorge and enter a wide expanse of farmlands. As far as the eye can see there is nothing but rolling fields. We visited this area this past weekend, and I had one main location I wanted to scout out -- a photographers dream -- The Fairfield House. I had heard about the abandoned farmhouse, and after a bit of internet research, was able to find its approximate location. We drove the curvy country road and around a bend, it came into view. And it was spectacular! Unfortunately, I have been unable to find any real information on the homestead except for it's name. Absolutely LOVE this shot! Old houses, barns, schools, etc are some of my favorite subjects! Great job!! Wow. Abandoned places can look great sometimes. Did you have a look inside? I know I would have. Quite a striking old place. It feels like a classic haunted house. Very nice! Ansel Adams would have loved it. My kind of road trip too, as a matter of fact we were able to drive thru The Dalles only as far as the museum. I have to go back. I wish I took this picture. Love it. It is a wonderful house indeed. And I love that it has a name. A wonderful image, really gets the imagination going! The totally barren landscape makes the image even more powerful. Wow - how incredibly beautiful! This has the quality of a painting and a real presence. It makes me want to know the story behind the abandonment. 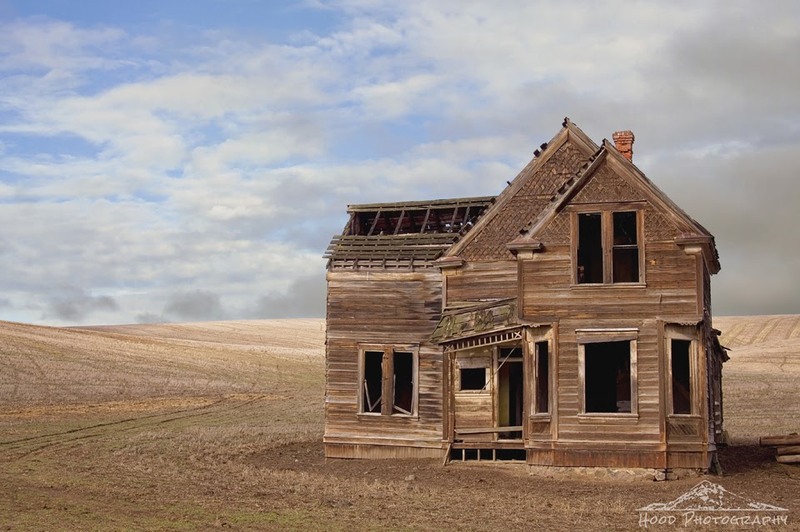 It is so strange to find an abandoned house in the middle of nowhere. You wonder who would have used it and why leave. Great shot of pretty decay here. wow wow wow! stunning! too bad this old farmhouse can't talk. really, really nice. i'm in love with old abandoned buildings, and you captured this one perfectly. An amazing old design looking so lonely in the sparse landscape. So dramatic. Beautiful sky photo and interesting posting of the old house! Love the colors. A picture really does speak volumes. Fantastic shot! Even in its state of disrepair, what a picturesque building and setting. Wow, you even got some blue sky! So beautiful! What an amazing building!